All About Spelling Level 7 on SALE! As many of you know, I am quite the fan of All About Spelling. It has been a wonderful program for my dyslexic son. Level 7 has been recently released and is currently on sale at 15% off through August 6th. Sales are pretty infrequent for this program, and if you are interested in getting the next level, now is the time! 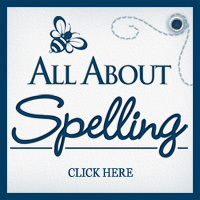 See All About Spelling for more on the program. Do you have an inventor in the house? We attended a local Maker Faire a couple of years ago. We definitely saw some unusual things. Unfortunately I can't find my pictures from the event or I'd share them, including the car covered with synchronized Big Mouth Billy Bass! Regardless, if you have a D.I.Y teen in the house, they might be interested in the FREE virtual Maker Camp. It started today and runs through August 24! This looks like it will keep your resident inventors busy for the rest of the summer. Sadly, the book goes downhill from there...quickly. The story is about seventeen-year-old Ember who is seized by the totalitarian government for noncompliance of Article 5 (her mother is a single mom) and taken to a reformatory where her one-time boyfriend-turned-soldier, Chase, breaks her out and begins their fugitive trek cross-country to find her mother, who has also been abducted. Secondly, the protagonist is naive and ignorant. She continually questions Chase’s motives and loyalties long after he has proven his reliability through his actions. The reader just wants to shake her. She makes foolish, rash decisions, and the reader wonders what on earth Chase sees in her. For example, Ember runs off several times and gets herself into trouble. A girl with any sense at all would not do this. Chase is an admirable character, but Ember is brainless and irritating. In addition, the whole “conflict” and “sexual tension” gets old really fast. Thirdly, the story is often implausible. Spoiler Alert! Skip to next paragraph to avoid spoilers. For example, during the climax of the book, Ember steals a gun from a soldier while his back is turned and then is able to “sneak” it back to her cell under a piece of clothing. There is no description of how she accomplishes this, and the result is that it sounds completely unbelievable. Later in the book, she and Chase “convince” a hard-core soldier to simply give up, walk away, and let them go. Seriously? Moreover, the big “twist” in the story is that Ember’s mother has been dead all along and Chase hasn’t told her because he is afraid she might not go to the safe house with him if she knew. I knew the mother was dead from the beginning, and I can’t help but think that other readers would, too. After all, this book is intended for high school level readers, not elementary. The condescending plot structure gives the reader the impression that the author has no experience with teens. Lastly, the book is poorly written. I understand authors can demand some creative license when writing, but the number of sentence fragments in this text are excessive. It makes the reader wonder if the author even realizes she is writing sentence fragments. It is like the difference between a novice painter and a master: Picasso could paint abstract cubism because he knew how to paint realism and had made a choice to paint abstractly. An amateur who paints cubism because he cannot paint realistically is just a mess. The same is true here. Aside from the two main characters, the rest are just flat stereotypes. The plot is drab and has few subplots. Article 5 contains some violence, including references to torture (“One of the soldiers was already preparing the fire hose inside. Beside him, a pair of leather cuffs were chained to the floor beside the baton” Simmons 94). The romance is focused mainly on kissing and bodies touching through clothing, but the descriptions are steamy. I would not give the book to a student under fourteen years old. Honestly, I had to force myself to finish reading this book in order to write the review. I give this book one star (out of five). If you are looking for a dystopian novel, look elsewhere.